Imagine knowing someone all your life, or seeing them everyday at school/work. Then the next day you return, and they are gone. A group of armed men taking your loved one away without a explanation. 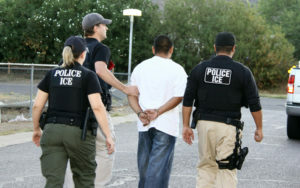 Well the U.S. Immigration and Customs Enforcement (ICE) is sadly one of those nightmares. Over 1,000 people are scared for their safety everyday. This country has so many undocumented immigrants, at any time, anyplace, ICE can come and take them away. Taken from their families, taken straight from their homes. What a traumatizing experience for anyone, right? I interviewed a family who knew someone at school who had been taken by ICE. I connected with them, and they shared that experience with me. For their protection, they had asked me not to their name, their friend’s name, or pictures I took of them. And just as I was going to publish the story, they decided not to share the story. It showed how seriously this matter can affect people. Here is a general description of what they told me. A Mexican family came without documentation. They enrolled their child in school and the child befriended other school children. The kids I interviewed said ICE had been around the school for a while. One day they walked to their friend’s house, so they could all walk to school together. When they got there, ICE had the whole family and walked the whole family to vans. The friends said they were devastated because they had no clue about the family’s situation.